Friday on Relevant Radio with Sean Herriott at 7 AM Eastern – “Feast Day of Chair of St. Peter” especially applicable with the current papal resignation. Friday on Ave Maria Radio with Teresa Tomeo at 9:15 AM Eastern, also discussing the Chair of Peter. RIO DE JANEIRO, BRAZIL, February 21, 2013 (Zenit.org) – Facebook users who access the World Youth Day Rio ’13 page will now benefit from the global setting supplied by that social network. The page is available in 21 profiles, and users are automatically directed to the page that represents their area. A click on the settings icon enables a user to change from page to page. 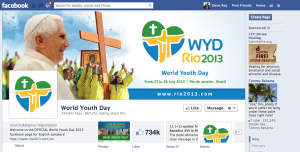 According to Benjamin Paz, director of communications of the 2013 Rio WYD, this innovation is very positive as it gives more credibility to the official pages and is based on statistics that will contribute to improve the strategy of communication in the media. ROME, February 20, 2013 (Zenit.org) – Benedict XVI’s renunciation has raised many questions, and not only in the Catholic world. Some of the questions are of a practical nature, while others regard more far-reaching doubts. Jesuit Father Federico Lombardi, director of the Vatican press office, has given several press conferences since the Pope announced his resignation Feb. 11. During the briefings, journalists have asked questions to which Father Lombardi gave answers with the information available at the time. Following is a quick and brief selection of 23 of these questions and answers, in summary form. They are not word-for-word quotes of Father Lombardi, but rather a synopsis of his responses. 1.What will be Benedict XVI’s last public appearance as Pope? A: Benedict XVI’s last public appearance as Pope will be the General Audience on February 27, 2013, in Saint Peter’s Square. Exceptionally, the general audience will include a liturgy of the Word and moments of prayer. The next day, Thursday the 28th, there will be a private audience in the Clementine Hall of the Holy See with some cardinals. This will be the last audience of his pontificate. 2. Does Benedict XVI have some serious illness in particular? A: No, Benedict XVI does not have a serious illness in particular. 3. Is it true that Benedict XVI has a pacemaker? A: Yes, it is true that Benedict XVI has a pacemaker. He has had it since he was cardinal prefect of the Congregation for the Doctrine of the Faith. A few weeks ago the batteries of his pacemaker were changed. 4. Will the encyclical on faith be published that Benedict XVI has been writing? 5. Why did Benedict XVI choose 8:00 pm on February 28 to end his ministry as Pope? A: Because it is the time in which he usually ends his work day. 6. Where will Benedict XVI live after he retires as Pope? A: Initially, for a period of two months, in the papal residence of Castel Gandolfo. Afterward he will return to the Vatican to live in the Mater Ecclesiae cloistered convent. 7. Is it true that Benedict XVI decided to resign during his apostolic journey to Mexico? A: During his apostolic journey to Mexico and Cuba, Benedict XVI matured in the matter of his resignation as one more stage in his long process of reflection and discernment on this subject. However, the trip had no other particular relevance in this regard. 8. What will Benedict XVI’s name and title be after February 28? A: It is a matter that is still being reflected upon. There is a certain unanimity that he should keep the name Benedict XVI and that his title should be “Bishop Emeritus of Rome.” In the Pontifical Yearbook Benedict XVI will continue to be the official name used. 9. Will Benedict XVI take part in the Conclave to elect his successor? A: No, Benedict XVI will not take part in the Conclave to elect his successor and he will not be part of the College of Cardinals. 10. How will Benedict XVI dress after February 28? A: It is not yet known how Benedict XVI will dress after February 28. 11. Is provision made in the Church for a Pope’s renunciation? A: Yes, a Pope’s resignation is provided for and regulated by the Code of Canon Law. 12. What will happen to Archbishop Georg Gänswein, Benedict XVI’s private secretary and prefect of the Papal Household over the last few months? A: Archbishop Georg Gänswein will continue to be Benedict XVI’s private secretary. He will accompany him to Castel Gandolfo (and later to the Mater Ecclesiae convent), and he will also continue to be prefect of the Papal Household. Similarly, it is possible that his second private secretary will go to Castel Gandolfo and accompany Benedict XVI for a time. 13. Who will live with Benedict XVI in the Mater Ecclesiae convent inside the Vatican after his retirement? A: The Memores Domini (a group of consecrated women, who help the Pope in the ordinary needs of a home), and his private secretary, Archbishop Georg Gänswein, will live with and assist Benedict XVI after his retirement. 14. Did the subject of the so-called Vatileaks scandal influence the Pope’s decision? A: It had no relevance. If one wants to receive correct information, one must limit oneself to what the Pope has said about his renunciation. 15. When, approximately, will the conclave begin? A: The most likely dates are that it will begin between March 15-20. 16. Did Benedict XVI change the norms for the election of a Pope in the last weeks? A: No, Benedict XVI did not change recently the norms for the election of a Pope. He made a small change in 2007 to modify the system of voting. The modification of 2007 establishes that a two-thirds majority will always be necessary in the voting carried out in the Conclave. However, the rest of the norms in force continue to be those of the Apostolic Constitution Universi Dominici Gregis. 17. Are there power struggles in the Vatican? A: In all institutions there is a dynamic that leads to different opinions, which is always good. The difference and diversity of opinions are positive if they lead to the good of the institution itself. However, such differences should not be given too much weight as they would not correspond to the reality or to persons’ intentions. To say that there are power struggles does not correspond to the reality of what is happening in the Church at this time. 18. Did journalist Peter Seewald interview Benedict XVI before his renunciation? A: German journalist Peter Seewald, who has interviewed Joseph Ratzinger-Benedict XVI several times in the past, interviewed Benedict XVI two and a half months ago. The interview is to be included in Benedict XVI’s official biography, on which Seewald is working. 19. Will Benedict XVI meet with the new Pope? A: There is no plan for Benedict XVI to meet with the new Pope. 20. Why has Benedict XVI decided to stay in a convent in the Vatican, after his two months at Castel Gandolfo, and not return to his native Bavaria? A: Although Benedict XVI has not explained it clearly, his presence and prayer in the Vatican gives spiritual continuity to the papacy. Moreover, Benedict XVI has been living in the Vatican for more than three decades.